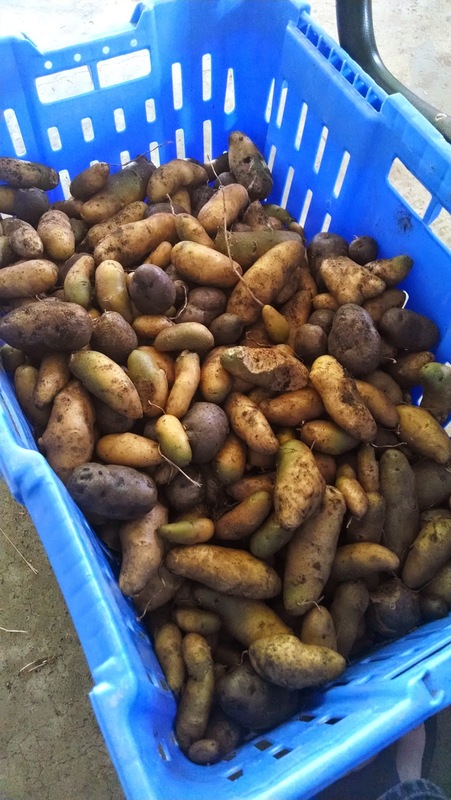 The potato beds are being emptied. Time for winter spinach to go in those beds. The wheelbarrow was filled several times. 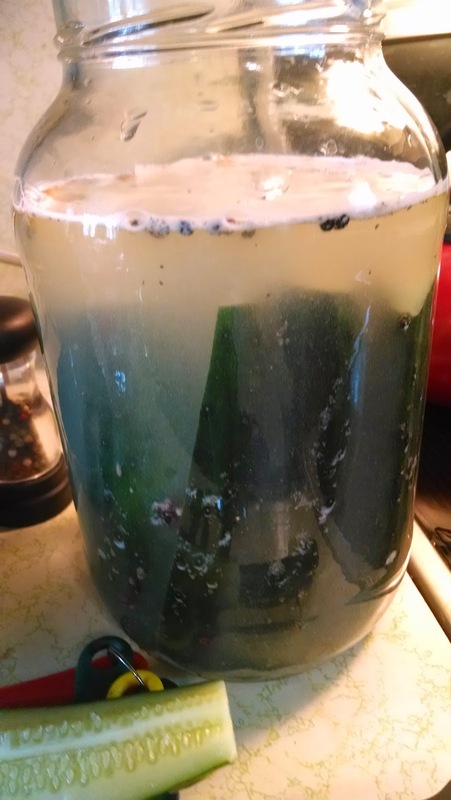 The Austrian crescent and all blue potatoes were in this batch. Neither is a big potato, they stay on the small side. Sorting them out. The ones that have some green spits or are faded or have a chunk missing stay here on the farm. Some the farmers eat, some will go back in the ground next spring. 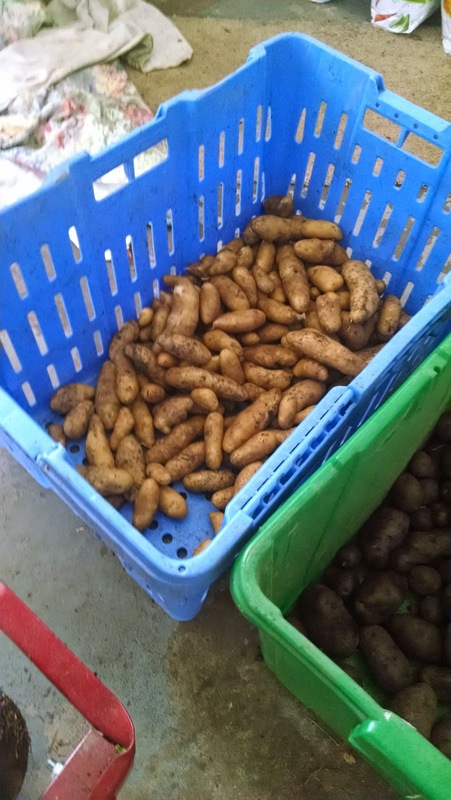 Those will be packed in burlap bags and kept in a space where the temperature stays about 60° year round. The two varieties are sorted by type, to then go out in our CSA shares. All the pretty ones. Yesterday we visited family and cooked up some with butter and salt. And chicken, cucumber and tomatoes. Nice to share what we grow with loved ones. Oh yes. It is busy time. Fruit is in. Tomatoes. Cucumbers. While winter squash...the hard rined, bake in the oven sort (including pumpkins), apples and potatoes, garlic and onions can be stored in a cool place and used and cooked as needed all winter, other things turn to mush without a more eventful treatment. So its busy time as we save food. 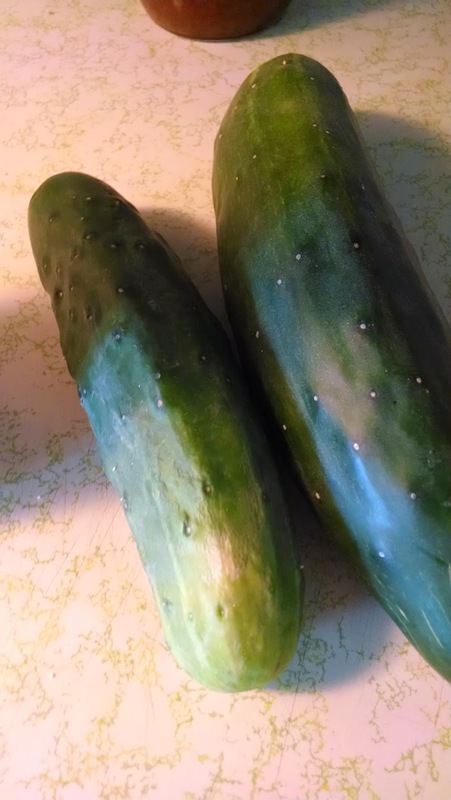 This morning cucumbers. With a bit of water and salt. And a few herbs and spices. 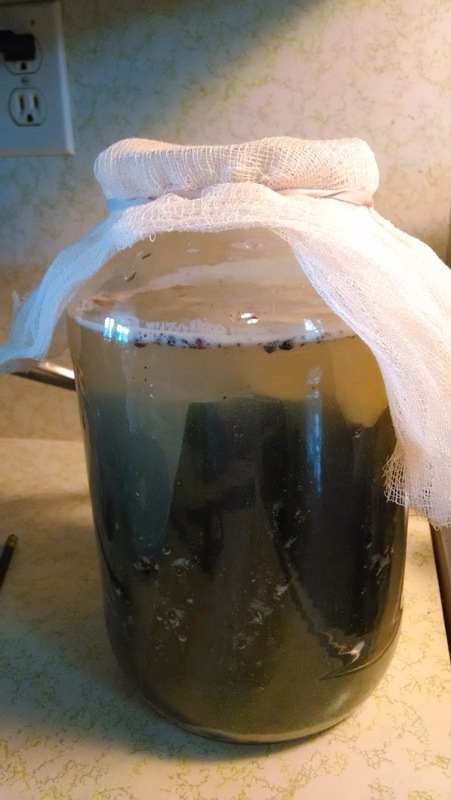 Packed tight in a glass jar. And then a piece of cheesecloth held on with a rubber band. Just to keep bugs out. 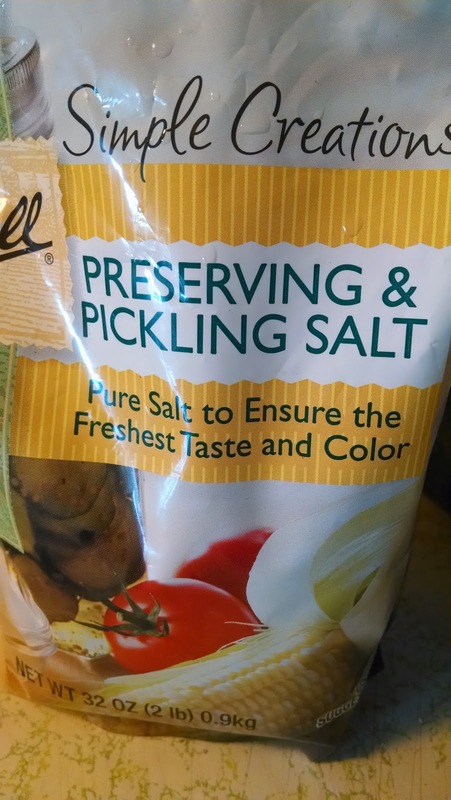 We will watch it, and in time the salt and flavors will permeate the cucumbers. 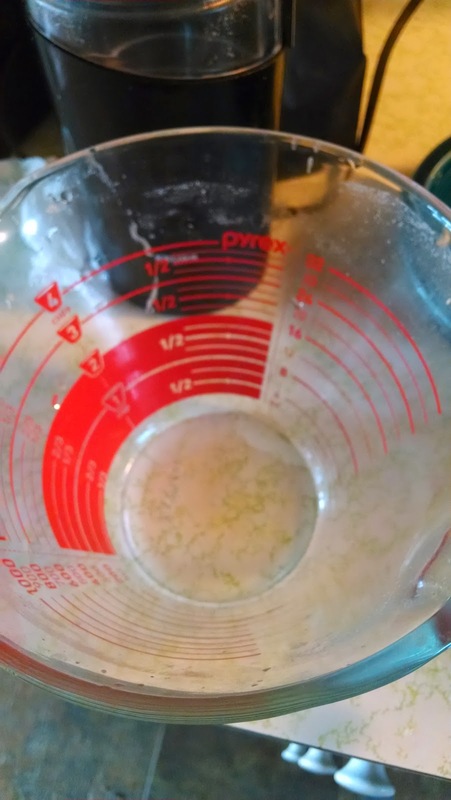 If a yeasty film forms that will be skimmed off. And this winter we will have a bite of the garden, suspended in salt. Next to a serving of something bland along with something sweet, this sour taste...yum. As usual, there are some greens, carrots, maybe beets, radish or lettuce in August shares. In addition, sometimes there might be cabbage or broccoli. The summer has been cool enough they have not bolted, and the broccoli will produce after we cut it. Predicted temperatures are in the low 80's and the broccoli does not mind that! The purple beans are in. 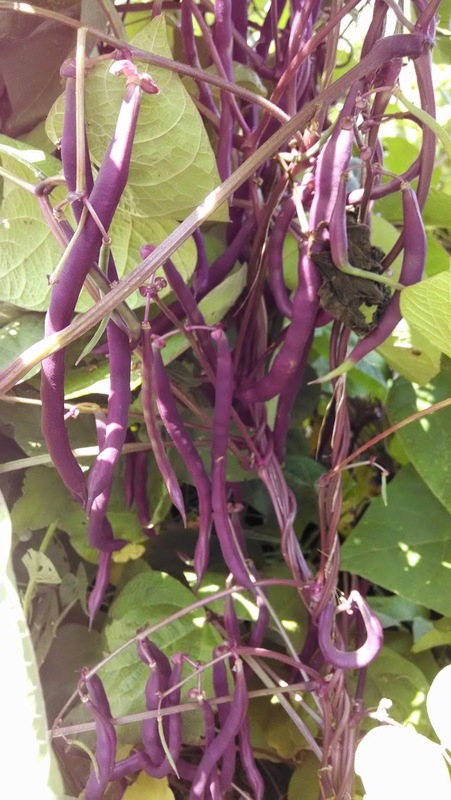 We get beans that are odd colors so they stand out from the green of the leaves. We have been known to miss them when picking if they blend in. So here they are. 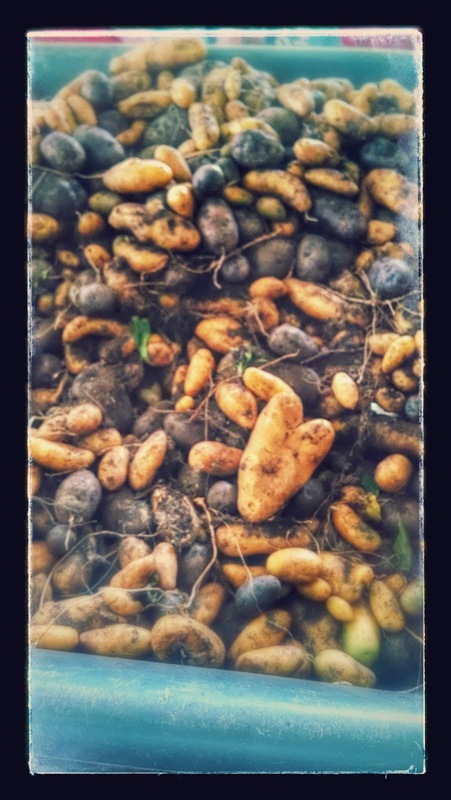 Last year our seed potatoes froze in storage in the garage. Outdoor temperatures in the single digits turned our plan table stock to mush. Kinda stinky mush. Virtually no harvest last year. 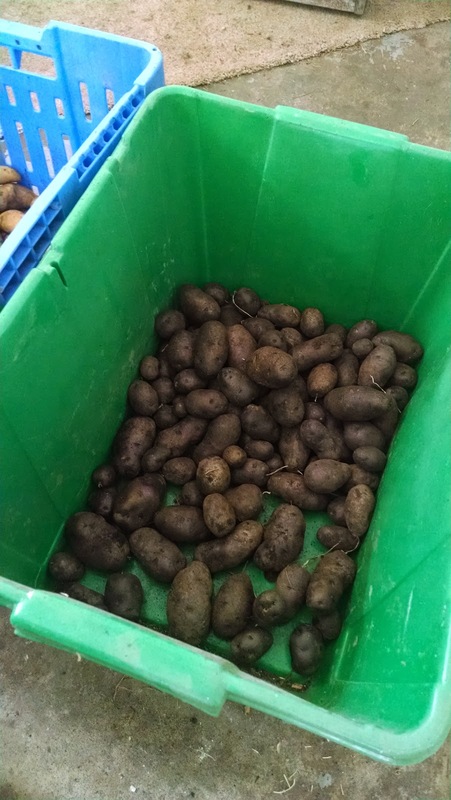 This year the seed potatoes went right into the right storage spot. Austrian Crescent, All Blue, Purple Viking and Yukon Gold are all looking and tasting wonderful. Tomatoes...about 10 varieties are all coming in. They are easy to freeze whole (after removing the core) and then cooking, using the immersion blender to smooth them out. Persimmon, Old German, Sophie's Choice, Mini Orange and more. Cucumbers too! A bit of basil too. We have tons of milkweed all over the farm. There has to be paw paws somewhere near here. We have sasafrass, oaks, maples and more. The beautiful butterflies: monarch and swallowtail need specific trees and plants for their caterpillars to grow and then form a chrysalis. We have those here, or close by. I bought a pack of zinnia seeds and they have bloomed. 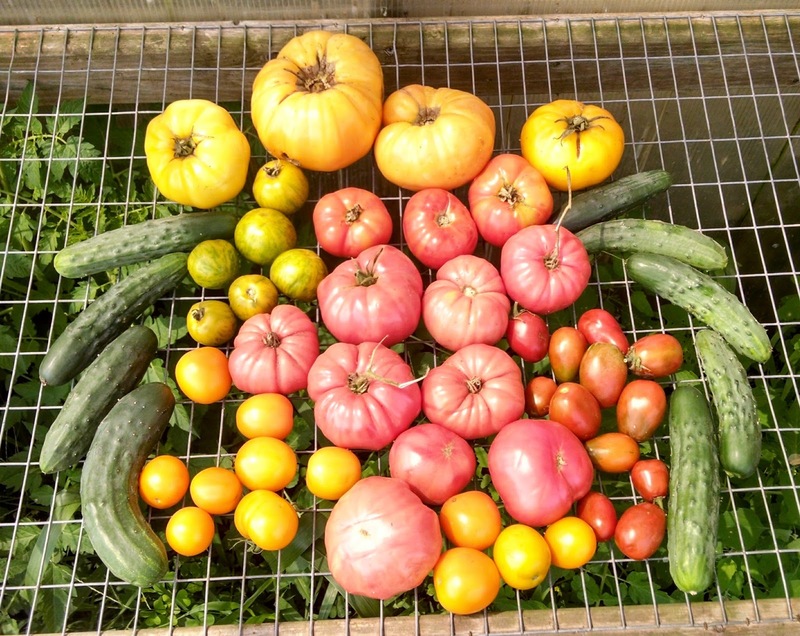 We give a few with each of our CSA shares. 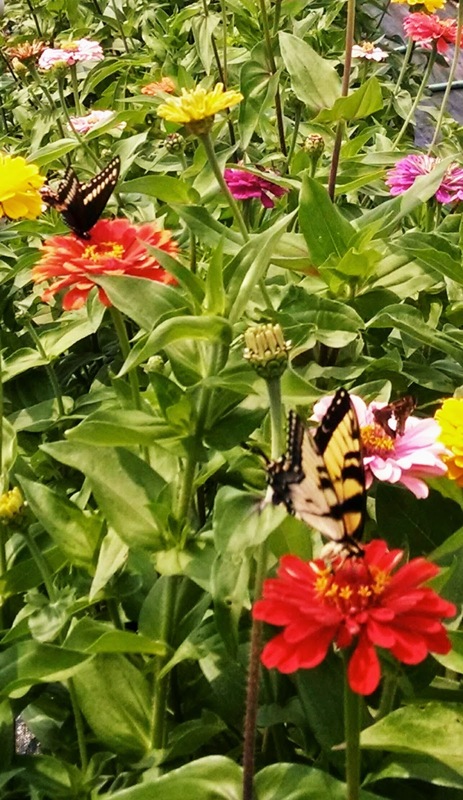 When Homer went to cut the flowers there were butterflies everywhere. Of all shapes and sizes and colors. They were so busy he didn't cut flowers the last couple of days. The bees were out in massive numbers too, so a baseball bat sized one left the farm today. He took this picture. And then left the insects to their fun in the sun. Lots of buds left for plenty more nose gays or tussy mussys. Sometimes we see photos of livestock that is pasture raised, and where they are standing has nothing but dirt or dust all around them. In different areas of the world the recommended number of animals per acre can vary widely. Management practices have a effect on how pasture grows. We have been rotationally grazing all of our livestock since we started farming, as the method just seems like common sense. Using electric lines we can easily move cattle from one small section of the farm to the next, and by the time the herd returns to the original spot there is plenty to eat again. 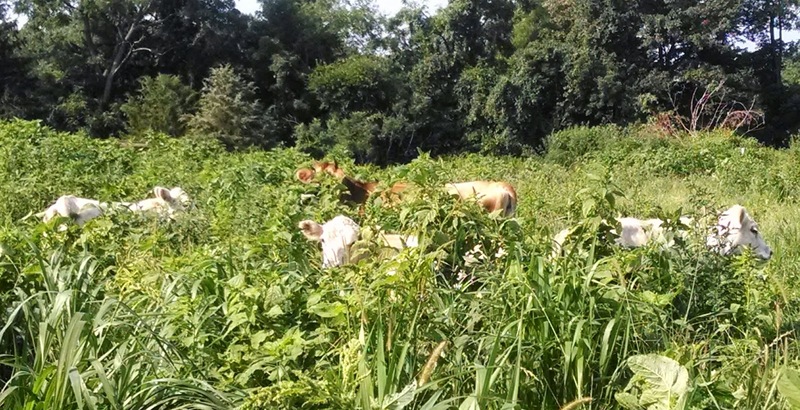 Pasture grows plentiful when eaten and allowed to regenerate. This is our herd the other day. The USDA has a defined pasture standard. Its something like an average of 3 inches height year round. That accounts for middle of winter when pastures can be quite short. This herd? The gal in the back is our 2 year old Jersey. Close to 1,000 pounds. Barely visible. Happy as any cow in high clover. Which, by the way, is the first thing eaten when they are moved into a new pasture.